This month marks the 100th anniversary of the sinking of RMS Titanic. To commemorate this event, a British travel agency, Miles Morgan Travel chartered two cruise ships to bring guests to the wreck site in the North Atlantic on the anniversary night. One ship, the Fred Olsen Line’s Balmoral sailed from Southampton, England. The other the Azamara Journey, sailed from New York. There was a great potential for these cruises to turn out badly. They could have been a tasteless attempt to commercialize a tragedy. Nonetheless, I felt this was too significant an event to miss and so I booked passage on Azamara Journey. As it turned out, the cruise was a very worthwhile experience. The days were mostly spent listening to an impressive battery of maritime historians and Titanic experts discuss various aspects of the Titanic story. When there wasn’t a lecture or event, you had the amenities of Azamara Journey. However, what made the cruise special was being at the wreck site on the anniversary night. We had had poor weather for most of the cruise but that evening it cleared and the conditions became like they were 100 years before. It was a cold, dark moonless night. The sea was relatively calm. Overhead were a multitude of stars. Whether you looked out into the blackness or at the lights of the Balmoral nearby, you could not help but feel moved. 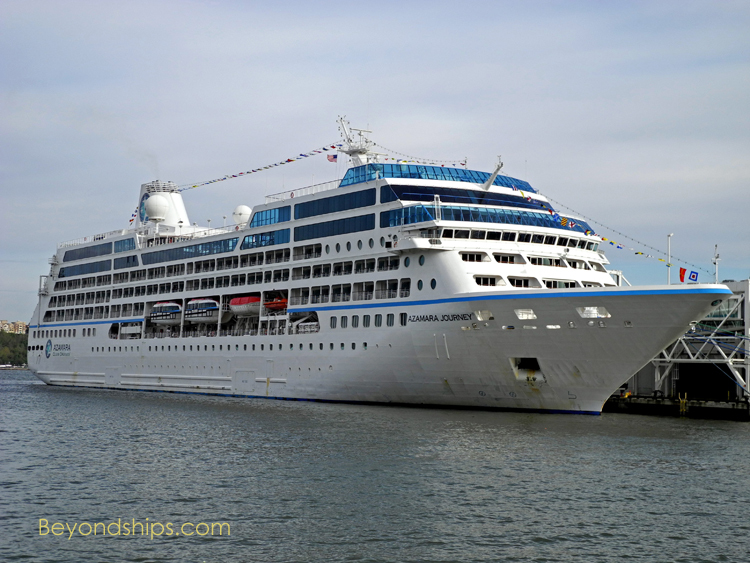 In addition, I have added a profile of Azamara Journey to Beyondships. Journey is one of the eight R-class ships built for Renaissance Cruises. Thankfully, Azamara Club Cruises has retained much of the ship’s original décor and so she still has the feel of an upper class English country house. 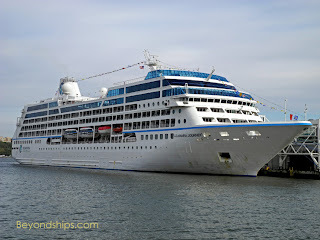 The profile of Journey is posted at http://beyondships.com/Azamara-Journey-Profile.html. It has copies of daily programs, menus and information about the ship. The multi-page photo review of the ship begins at http://beyondships.com/Azamara-Journey-Tour-1.html. In addition, I’ve posted an interview with Edie Bronstein, Azamara’s Senior Vice President, in which she talks about the cruise experience Azamara aims to provide on its ships. http://www.beyondships2.com/azamara-svp-interview.html.